In this age of the printed word, calligraphy is something of a dying art. Even with my love of fountain pens, I’m ashamed to say that my handwriting would barely suit the medical profession. My handwriting can never be described as eye-candy. When you think of calligraphy, you think of monasteries full of scribes, carefully and painstakingly illuminating hand-written, gothic text. That’s just the Roman languages. Art is an even more appropriate descriptor for Japanese, which is a written language based on pictograms, tens of thousands of characters, as opposed to the simple 26 we get in English. With that kind of complexity, it’s no surprise that people who are adept with brush and ink can be lauded for their visual expression as well as their poetry; thought and form truly go hand in hand. 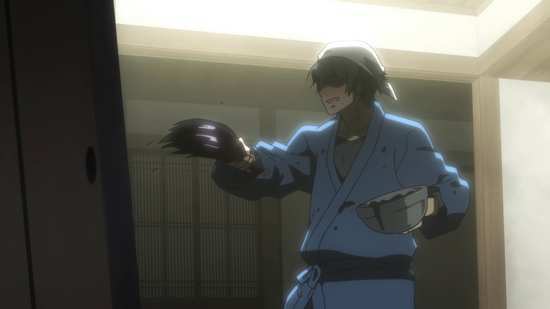 And with that kind of notoriety can also come pressure, which is our jumping point onto Barakamon. 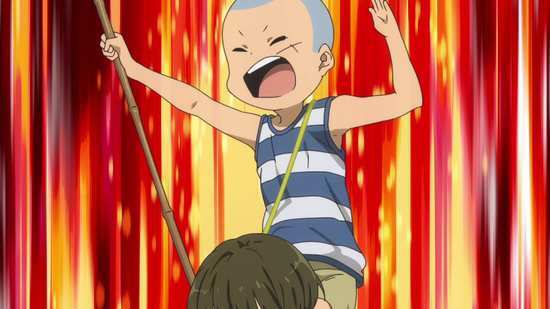 Barakamon was released in the UK by Funimation last year, and has been reviewed for the site by Stuart McLean. But there was that one day that Amazon had a pricing glitch, and I wound up importing the US release instead. The difference is in the packaging and the region coding of the DVDs. But like the UK release, it too is a combo collection. They say the truth hurts, but they never specify just who. Certainly it’s the kind of sting that infuriates young calligrapher Seishu Handa when a critic describes his work as safe and bland. But his response, punching that critic in the face at an awards presentation is the kind of thing that justifies his exile from polite society. He winds up in an isolated village community on the island of Goto, far too rustic for his city-raised tastes. But when he meets a precocious young girl named Naru, his outlook begins to change. 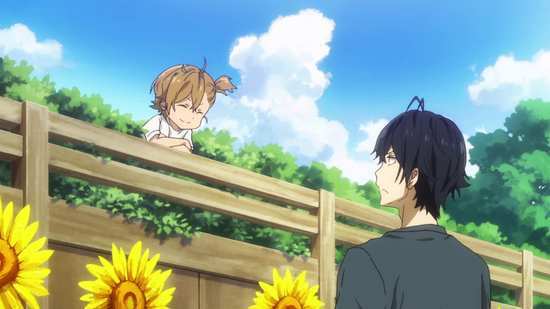 Twelve episodes of Barakamon are presented on 2 Region A/B Blu-rays from Funimation. The package also contains the show on Region 1 DVDs. 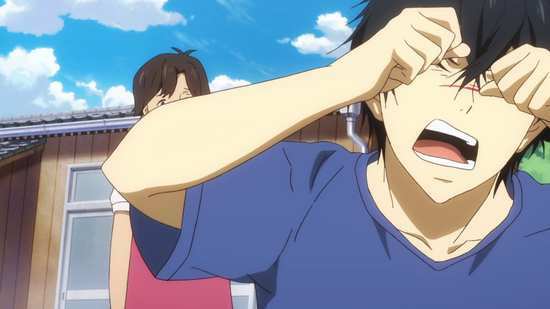 Barakamon gets a 1.78:1 widescreen transfer on the Blu-ray discs. The image is presented very well on these discs, clear and sharp, with strong consistent colours. The only nit to pick at might be a smidge of digital banding during scene fades, but that’s about it. It’s a very pleasant, slice-of-life animation, with pleasant and memorable character designs, a warm pastoral feel, and smooth and crisp animation. 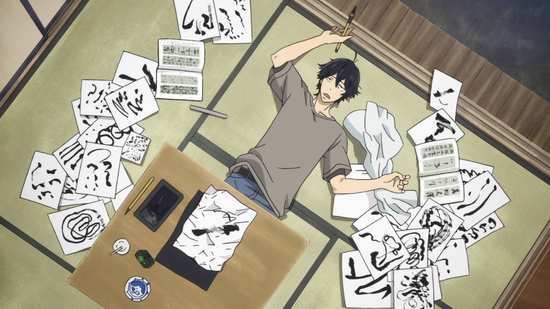 Barakamon is a very watchable show, although I’m not the best person to actually judge the quality of the calligraphy in the story. You have the choice between Dolby TrueHD 5.1 Surround English and 2.0 Stereo Japanese with optional English subtitles and a signs only track. I went with the Japanese audio and was happy with my preference, with the actors suited well to their roles. Kenji Kawai provides the music and it very much captures the feel of the story without overpowering it. The subtitles are accurately timed and are free of typos, although the theme songs lack lyric translations. I gave the dub a try and it was pleasant enough, although it didn’t quite capture the differences in dialect that were so obvious in the Japanese version. You get 4 discs in a BD Amaray style case, one disc held on each face of two centrally hinged panels. The reversible sleeve has an episode listing on the inside (or outside depending on your preference) and unlike the UK release, the US has an o-card slipcover repeating the case art. The discs boot to static menus. Disc 1 autoplays a trailer for Funimation NOW, and the sole extra on this disc is the audio commentary on episode 1 from ADR Director Mike McFarland, Alison Viktorin (Naru), and Rob McCollum (Seishu Handa). Disc 2 autoplays a trailer for A Good Librarian Like a Good Shepherd. You get an audio commentary on episode 12 from assistant ADR director Felecia Angelle, with Lynsey Hale (Miwa), Apphia Yu (Tama), and Duncan Brannan (Kawafuji). You’ll see the textless credits on this disc, the US trailer, and further trailers for Fairy Tail Part 20, The Rolling Girls, Assassination Classroom, The Girl Who Leapt Through Time, The Boy and the Beast, The Heroic Legend of Arslan, and Doamygar-D. This may be the most inspired slice-of-life premise that I have seen, or at least it’s pitched perfectly for my sensibilities. 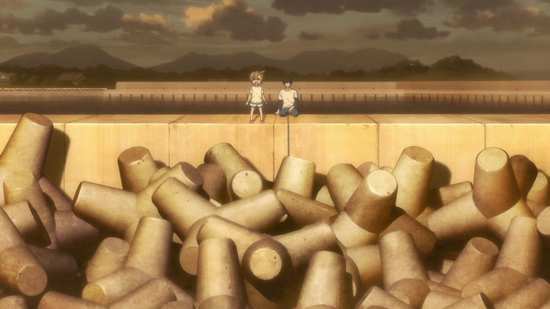 Barakamon comes across as a blend of Local Hero and Usagi Drop, a movie that I have plenty of time for, and one of my favourite anime series of all. Local Hero saw an urban, city-living businessman sent on a trip to an isolated Scottish community, and being affected by the change of pace, the different way of living, while Usagi Drop was a delightful show about the unlikely family that formed when a carefree young man adopted his late grandfather’s illegitimate daughter. There’s something charming about the relationship between an inexperience adult and precocious child when done right. 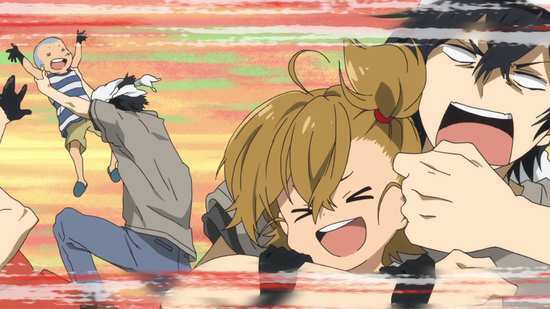 Barakamon manages to blend the essences of both Local Hero and Usagi Drop and come up with probably the most satisfying slice-of-life show that I have seen in quite a while. Seishu Handa is the over-stressed urbanite in this story, a young man who’s making a name for himself with the artform of calligraphy, albeit by sticking to a measured and traditional style, garnering praise for remaining proper. When a critic describes his work as bland, and laments that he has no style of his own, Handa takes it the wrong way and over-reacts. And so it is that this Tokyo boy born and bred finds himself on the island of Goto, sent there by his father until he finds some perspective, although Handa thinks that he’s there to find that personal calligraphy style. It’s an immediate culture clash, walking out of the airport into the countryside, no ride waiting for him, and making the long walk to the village, he hitches a ride on a tractor trailer driven by an old man. It’s a world with a different pace of life, where everyone knows and trusts each other, where there’s no need to lock doors, where the village phone is in the village shop, and has a rotary dial, and everyone else speaks in a different dialect. The house that Handa is staying at is supposedly vacant, but the local kids have been using it as a secret base, and aren’t about to stop now. Before Handa can be overwhelmed by culture clash, he’s overwhelmed instead by the precocious granddaughter of that tractor driver, Naru Kotoishi. She’s six years going on seven, gregarious, outgoing, makes herself at home, and latches onto Handa like he’s her new favourite toy. Handa’s an introverted artist with few if any friends, and a tendency to lapse into isolated depression. When Naru inadvertently offers the same criticism that provoked Handa’s outburst, it looks like she may have triggered him again, but on the first day on the island, she drags him to see a sunset, teaches him how to climb. 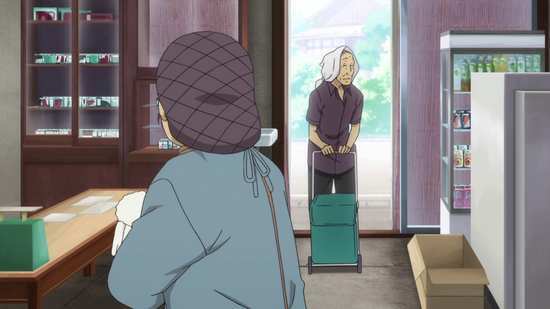 So begins Handa’s life in the village, where he tries to spend his waking hours rediscovering his calligraphy mojo, but winds up exploring Naru’s world, seeing thing from her perspective, as well as getting to know the villagers, the island and the local customs. 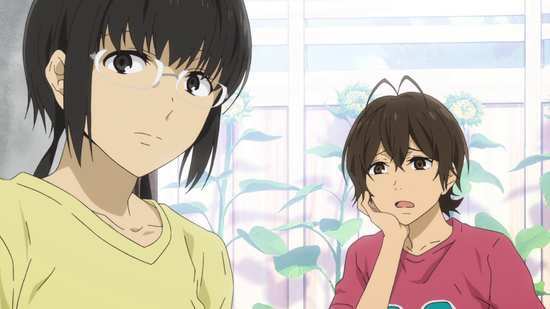 Naru’s best friend is a girl called Hina who Handa learns firsthand is prone to burst into tears. Two older girls are Miwa and Tama. Miwa’s a bit of a tomboy and quite mischievous, while Tama has the unique standing of being the only otaku on the island. She wants to be a mangaka, although has an odd idea of what stories she wants to tell. And when she sees Handa with Hiroshi, her dormant BL fan is awoken. Hiroshi is the son of the village chief, decidedly average (except for his ambition to catch a certain fish), and who winds up cooking for Handa. 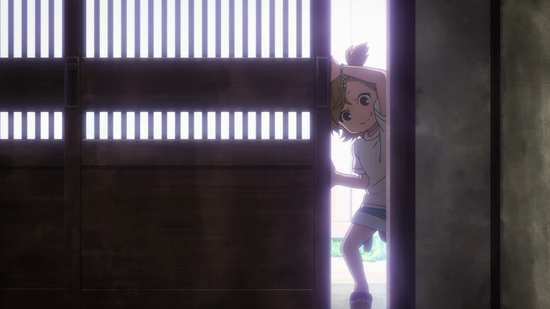 Although the question as to Naru’s parents is asked, no answer is offered in the show, but it’s clear that the relationship between Naru and Handa takes on that tone, although it’s also clear that Naru has most of the power in the relationship, the local kid with local knowledge having fun playing with ‘Sensei’. As Handa starts to care about Naru, that affection slowly grows to the other children, the people and the island as a whole. 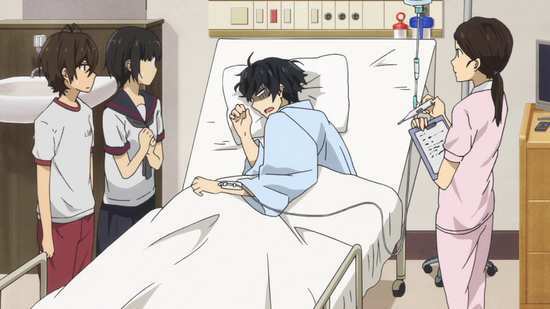 He becomes one of the community, and inevitably that leads to the show’s conclusion, where he has to make a decision about going home to Tokyo after being ‘rehabilitated’. 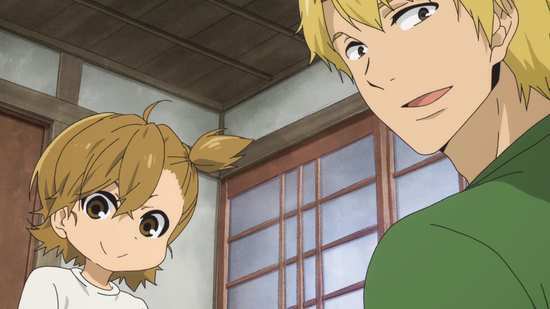 It really is Local Hero crossed with Usagi Drop, the quirky sense of family and community that you get in small villages, as well as the affectionate friendship between Handa and Naru. 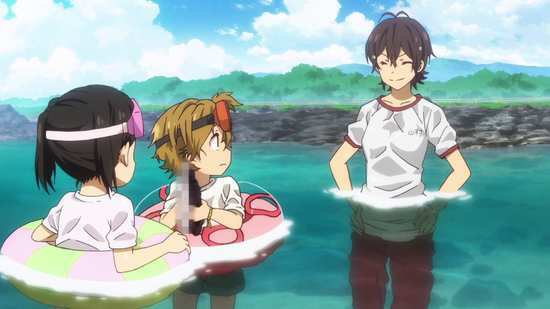 Barakamon is a delightful show, full of warm and gentle comedy and a cast of wonderful characters. 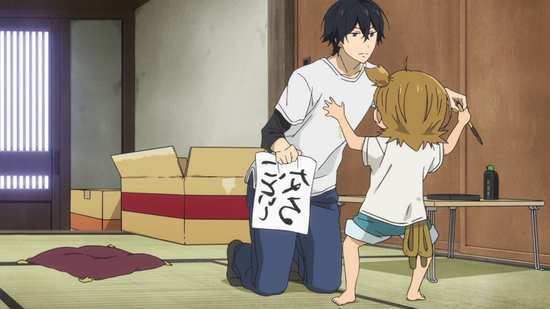 Barakamon is an ongoing manga in Japan, and it’s also spawned a prequel, itself recently adapted to anime and released in the US and Australia. Handa-kun is about the main character’s high school life in Tokyo, which sounds interesting, but also utterly conventional compared to this show. Barakamon has a UK release, identical to this US release, except for DVD region coding, and the lack of a slipcover, but it’s well worth seeking out.